1. Colony, large number of birds, insects, etc. moving about together. 2. Places being overrun or crowded. 3. Climb by clinging with arms and legs. SWARM: 1. Colony, large number of birds, insects, etc. moving about together. 2. Places being overrun or crowded. 3. Climb by clinging with arms and legs. Starting from the premise that networks are vectors of a new geography that have transformed and molded how we live in society, and that the Internet has become the dominant structure of cultural, economic and military power, the need arises to represent this society that operates on the basis of (mostly invisible) networks. One might ask how to navigate these, appropriate them and turn them around. SWARM is a site-specific installation that explores the concepts of network and swarm intelligence. A swarm intelligence system comprises individual agents interacting with each other and with their surroundings. The agents follow simple rules and, even though there is no control structure dictating the behavior of each one, the local interactions between the agents leads to the emergence of complex global behavior. Many social movements of civil resistance currently follow this model: they work without any management board or general secretariat. Decisions are taken collectively at a local level, and it is their regional councils, elected by popular vote and constantly renewed, that put forward and oversees the transparency of their actions. SWARM is a constructed environment and in this sense can only be viewed as an imperfect model, an approximation to my ultimate vision of human relations. 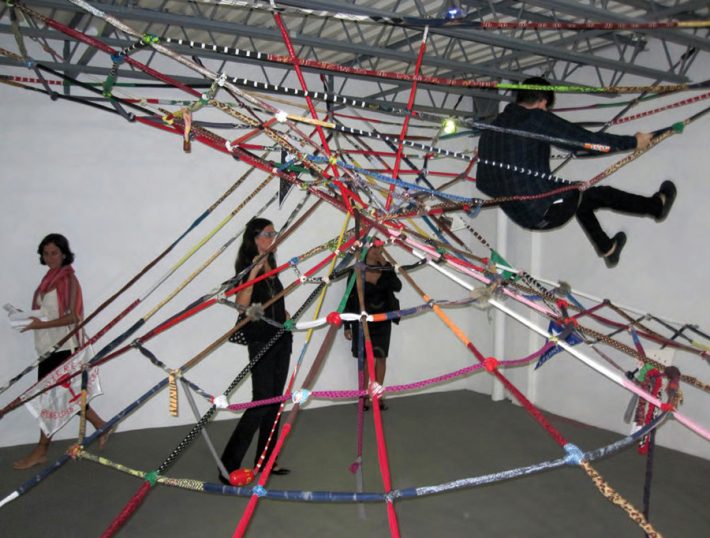 The installation comprises a large net similar to a spiderweb occupying the entire space of the Project Room. It is designed for visitors to climb over it, explore it, interpret it and appropriate it for themselves. Each at their own pace and in their own way. This invitation to action can be read as a call to take part in the social networks that arise. Espacio 1414, San Juan, Puerto Rico. 2010.
within our community. It is an encouragement to participate in social and collective processes that can generate wellbeing, dignity and autonomy at individual, local and, eventually, global levels. SWARM subtly invokes social responsibility and citizen participation. 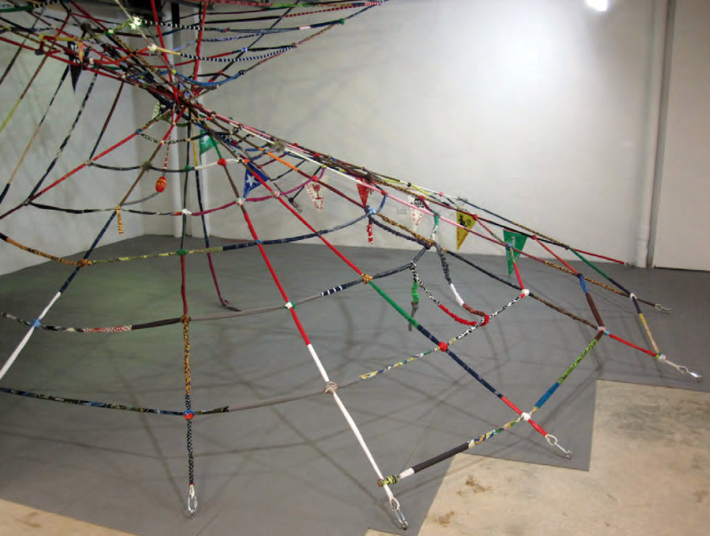 By climbing and exploring a network, I want to generate a playful area of introspection where visitors can reflect on how they inhabit and act in space, and on their position within the social grid they belong to. The different texts found around the installation are personal statements on my micro- and macro-setting, how I make use of and inhabit them. References to heterotopias sprinkled with humor, maps and countries on the world’s black list, invitations to take direct action and affirmations of identity and gender that sketch out my current mental landscape – mentalscape- . The intense effort of embroidering these declarations responds to the integrity with which I consider them and the work entailed by living and acting true to a certain ethos. SWARM is woven from deconstructed clothing from KRESS stores. Garments as the raw material for our network are a direct reference to textiles that, in and of itself, are a mesh of fibers. Therefore, the grid structure of the installation is reflected in miniature inside the material. Clothes have the primary function of enclosing or surrounding the space around the human form. It is a kind of intimate architecture and is considered as our second skin. The one with which we face up to daily life in society, and that identifies us as individuals with preferences and the power to decide on how we reveal ourselves to the world. In this sense, the bits and pieces of clothing can be seen as people forming the base unit of social architecture. From the aesthetic point of view, these remnants are the base unit for the installation. The act of weaving confronts us with the social fragmentation that exists and has been violently imposed on us, but the weaving in question also reminds us of the possibility and responsibility we have in our hands to rebuild the socio- cultural lattice in the light of our needs and preferences. Carolina Caycedo for the Project Room at Espacio 1414, January, 2010.